Special Containment Procedures: SCP-729 is stored in a standard security chamber at Site ██. For ease of testing SCP-729 has been connected to the Site ██ water and sewage systems; however, use of the object outside of test conditions is prohibited. The risks associated with passive interaction with SCP-729 are minimal. Some staff have reported feeling 'dirty' or 'stressed' during prolonged periods in the vicinity of SCP-729, accompanied by a mild compulsion to make use of SCP-729 to bathe. This compulsion does not appear to be strong enough to force staff to break containment protocols so as to access SCP-729. However, staff feeling said compulsion are encouraged to leave the vicinity of SCP-729. 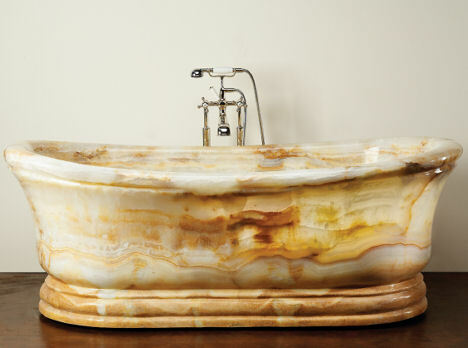 Description: SCP-729 is a large bathtub carved from marble. The item's properties were discovered by accident during a police reconstruction of a suspected murder-suicide in ████████, ██; it was retrieved by an undercover Foundation agent soon after. Bathing in SCP-729 has been described as extremely relaxing to the extent that individuals using it for this purpose must be encouraged to leave by an external force; they will not exit the bath of their own accord. The primary effect of SCP-729 begins to manifest between 5 and 15 minutes after an individual has begun to bathe. At this stage, all foreign or abnormal objects are forcibly expelled from the user's body; this has been observed to include artificial implants, parasitic organisms, cancerous growths and [DATA EXPUNGED]. While under the influence of SCP-729, users appear unaware of this process. If disturbed by an external force, they immediately experience extreme pain consistent with the trauma inflicted upon their body. Objects removed in this way typically settle in the water alongside the bather. Approximately 4 minutes after the initial manifestation of SCP-729's effect, bathers begin to suffer from rapid muscle wastage; material lost in this way becomes mixed with the water within the bath. As a result of this, bathers quickly lose the strength required to exit SCP-729 even if they were so inclined, and must be assisted by external observers. Within 6 minutes, the process begins to affect major organs, extracting them from the body almost intact; death typically occurs soon after. Despite the massive trauma inflicted in this way, users remain ignorant of the effect unless alerted to it by an external force. Complete deconstruction of the bather's body is typically completed within 20 minutes of the onset of SCP-729's effect. At this stage, it is possible to extract specific organs from within the mix of water and organic material left within the bathtub, although these are typically damaged to some extent. If left in SCP-729, these remains are further deconstructed; after 5 hours, no identifiable material remains, with the contents of SCP-729 instead comprising an organic 'soup'. Long-term tests have indicated that this appears to be slowly absorbed into SCP-729, leaving clean water after 8 days. Parts of the stone from which SCP-729 is carved subsequently show discolouration.